We hope you have had a great summer. Torontoberfest, which is our final event of 2018 will be returning to the Evergreen Brick Works on Monday, October 8th. Torontoberfest will feature a dynamite lineup of Ontario craft brewers to close out our season at this Oktoberfest-themed celebration. We’ll be welcoming Anderson Craft Ales, Beau’s, Cowbell, 5 Paddles, Muddy York, Shacklands and a few more to serve up some delicious brews. And on the food front, we are thrilled to have back Delight Bite, Eva’s Original Chimneys, Heirloom, Los Vietnamita, and the Pop Stand. 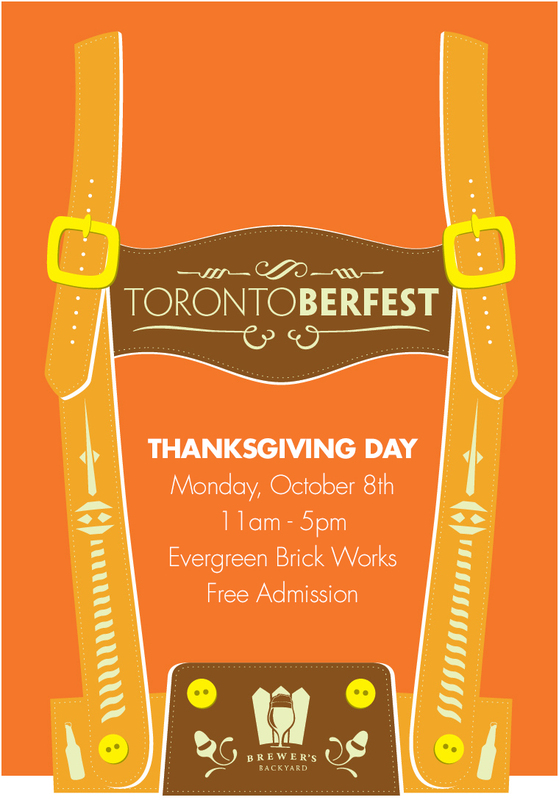 Torontoberfest will run from 11 am until 5pm on Thanksgiving Day, Monday, October 8th in the Pavillon area of the Evergreen Brickworks. We will be having our “First Call” special again with all beers $5 for the first hour. So the early bird gets the beer! Admission is free, the event is all ages and no tickets are required. However, beer will only be sold until 4:30pm and last pour will be at 4:45pm, so come early to enjoy the best selection and opportunity to enjoy some delicious Ontario beer and food. Hope to see you all there.